Following months of indecision and paralysis, the US administration today revealed an initiative for President Barack Obama to flip a coin to decide what course of action to take in Syria. The unexpected declaration has electrified the on-going debate over Syria and sharply divided opinions within policy circles. President Obama announced the initiative in a press conference held at the White House this morning, outlining the reasons for this unusual but not unheard of strategy. In a typically dramatic gesture, Obama took a coin out of his pocket and lifted it up and declared “this is change we can believe in.” This was interpreted by analysts as a reference to Obama’s popular election campaign slogan in 2008, and was seen as an attempt to tie the initiative to Obama’s earlier idealistic policies. Explaining his decision, Obama spoke of the difficulty he had been facing in taking a decision over how to respond to the conflict in Syria and the demands of the US to intervene and put an end to the bloodshed. The emotional speech gave an image of a man torn by his own indecisiveness and the tendency of his advisors and close allies to use words arranged in sentences to try to influence his decisions. Cultural experts confirmed that the practice of flipping a coin is indeed an established method of settling disputes in the United States, although it’s usually used in common everyday situations not important policy decisions. An anthropologist we spoke to explained that coins in the US have two sides, a ‘head’ and a ‘tail’, and decisions are based on which face lands side-up after the coin is thrown in the air. The coin-flip idea has been greeted enthusiastically by supporters of the American way of life because of its historic roots within US culture. Senior Republicans however came out against the initiative, accusing Obama of cowardice and lack of spine and many on the Christian Right accused Obama of resorting to sorcery, saying he should have prayed for the Lord to show him the right way. But Democrats came out in defense of Obama, saying that the coin-flip is far more rational than Ronald Reagan’s ‘government by horoscope’. Whatever the outcome is, this debate has certainly opened old wounds in American political life. 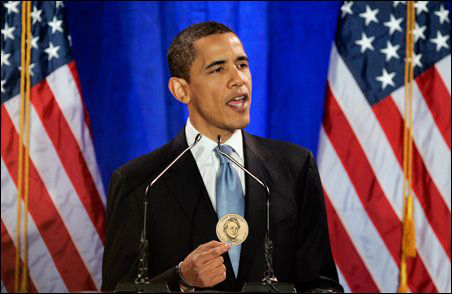 Obama was careful to explain that using the coin to settle the matter is also a nod to Syria’s long and rich history since coins were originally invented in ancient Syria. Although historians are still unable to explain what the person who made the first coin thought he was going to use it for, but it’s generally agreed that Syria has always been difficult to understand. Exclusive: What is Nick Griffin doing in Beirut?